In 2018 a new test will be introduced to the NHS Bowel Cancer Screening programme in England. This test is the Faecal Immunochemical Test (FIT) and will replace the stool test that has been used since the programme began in 2006. Both the old and new tests detect blood in stool samples however they use different methods to do this. The test we currently use (the Faecal Occult Blood test or FOBt) relies on a chemical reaction that occurs if blood is present and this produces a blue colour. If we see a blue colour on the test strip this is reported as positive and the person will be referred to a screening centre for a consultation prior to a colonoscopy (a test to examine the inside of the bowel). The current test requires three separate stool samples to be collected. Depending on the pattern seen sometimes we ask people to complete one or even two more test kits which can mean collecting up to nine stool samples. The new test only requires one sample to be collected. 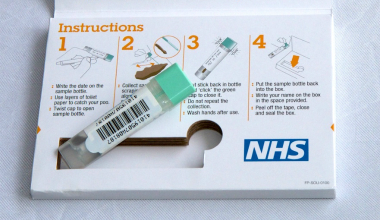 This sample is collected into a test tube which is sent through the post to the bowel cancer screening Hub (an NHS laboratory). As well as being a lot simpler and more pleasant to use, FIT is also a more sophisticated and reliable test that uses an antibody to bind to any blood present so we know how much blood is present in the sample. A pilot study using the new FIT test was carried out in two regions of England in 2014 (Southern England and North West England). 1 in 28 people that were invited to participate in screening were sent a FIT kit rather than the current testing kit. The results of the pilot study showed that more people participated in the screening programme if sent the FIT test compared to the current test kit and the FIT test also has the ability to detect more cancers. A similar pilot study was carried out in London in 2016 and came to the same conclusions. One of the aims of the screening programme is to encourage as many people to carry out the test as possible so we were very pleased to see that the new test did encourage more people to return their test kit. In England we plan to implement FIT in April 2018. England has five bowel cancer screening hubs that run a phone helpline and carry out the testing. The current plan is that all hubs will start using the new test on exactly the same day. It will take time and additional endoscopy resource to implement FIT optimally. Once the FIT test is fully introduced our role within the Bowel Cancer Screening programme will be to constantly review the process and the outcome data. We will use this, alongside data from other screening programmes across the world to help optimise our programme in England.